CPS Energy issued a request for proposals Friday for a pilot program that would expand local access to rooftop solar. The proposal seeks developers who, representing CPS Energy, will install and maintain solar systems on residential and commercial rooftops at no cost to the customer. CPS Energy will buy the output, and customer would be paid for the use of the roof. “We’re excited about the prospect of increasing the amount of rooftop solar in our service territory by making it available to more customers.” said Cris Eugster, executive vice president and chief generation and strategy officer. Eugster announced the development of the rooftop pilot and a community solar program last October. CPS Energy released a request for proposals for our first community solar project late last year, and we expect to announce a partner by March. If the rooftop pilot is successful, the plan is to expand it to 25 or even 50 MW over several years. For comparison, since 2007 San Antonio homes and businesses have installed slightly more than 20 MW of photovoltaic rooftop solar. Expanded access to middle and low income customers: because there is no out of pocket cost to the customer, households and non-profit organizations otherwise unable to afford rooftop solar could reap the benefits. Local preference: the RFP awards additional points for local companies. CPS Energy would be able to continue its support for rooftop solar in a sustainable and more equitable way. “This program has the potential to bring solar power to the rooftops of people who couldn’t afford it before,” said Anita Ledbetter, interim executive director of Solar San Antonio and executive director of Build San Antonio Green. Ledbetter previously served as executive director of Solar San Antonio, from 2004 to 2006, before taking the helm at Build San Antonio Green. 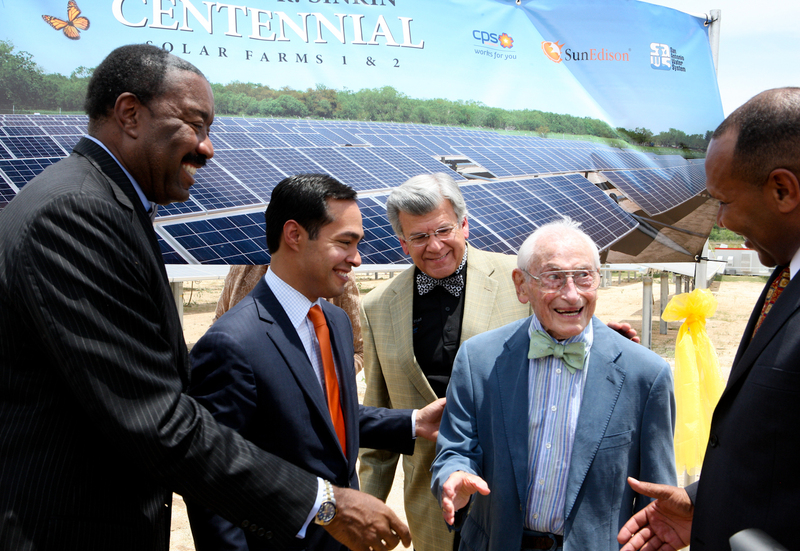 CPS Energy CEO Doyle Beneby, left, with former Mayor Julian Castro and SAWS Chairman Berto Guerra, congratulating Bill Sinkin in 2012 on the opening of the Bill Sinkin Centennial Solar Farm. A solar farm, usually about one megawatt, is built on several acres somewhere in our service territory. Customers purchase units (usually panels) of the farm, and are then credited based on the amount of power their share produces. Community solar is perfect for customers whose roofs may not be ideal for solar, or for renters, who can move and still receive credit on their bill for the power their share of the community solar farm produces. In order to smooth the transition from the rebate program to these new initiatives, agreed to extend our rebate program through 2015. 1) How can we find out if and when we qualify for the rooftop solar program? Is it based on a survey of our house or is the plan only available in certain neighborhoods at first, with more general availability later? 2) What if our house is already pre-wired for solar, will we receive additional rebates or incentives? Hi, I am interesed please sign me up or sent me any information to sign up thank you ! How does one get involved. Sign up and get this at their house. Sounds like a way I could help our community. How do I get involved or signed up for this. Would love to help our community. Thanks for your interest. The answer is, we don’t know yet. This program is the first of its kind, and it is a pilot – a test to see if a larger program would be successful. Customer eligibility for the program will ultimately be determined by our chosen partner, based on a contract we approve. Once we have negotiated a contract, we will work together to make sure those who are eligible have a chance to be considered. Developers have until March 6 to submit a proposal. After that, we will analyze the proposals and interview finalists. Once we identify the company and proposal we feel will have the best chance of success, we will negotiate a final contract. This could take several weeks. At the appropriate time, we will work with our partner to publicize the details of the program and identify eligible customers. A positive side effect of this early interest is that it may help us determine whether to expand the program. High interest is an indication that we could successfully expand the program and put solar on the rooftops of more customers. We thank you for your patience and interest as we work through this process. I am very interested in your solar project. I am on a limited income and my gas and electric bill last month was $378. I can not afford to pay that high bill and can not afford to pay for solar power. For that reason I am very interested in this project. Please keep me in mind for this project. Lorelei Lambert. Hi Lorelei, we are still working on the final details of this plan, so please standby. We’ll be sure to announce it here in the CPS Energy Newsroom when we launch. In the meantime, have you thought about any of our other Ways to Save? Check out our website at cpsenergy.com and search ways to save for customer assistance programs, thermostat options, rebates, and more. We’re here to help. Would like more information on the solar program. How do we sign up?? Hi Judy, thanks for your interest in our upcoming program. We are still working on the final details, so please keep an eye out. We’ll be sure to announce it here in the CPS Energy Newsroom when we launch. Thanks! Is this for real or is it a joke, I myself am not joking, I live on a limited income and I would like to have solar panel placed on my roof but can not afford them, Please send any form I may file in order to receive this benefit your letter does not say yes or No. Please give me more information as how to sign up. Hi Khoi, as soon we the details, we’ll share them. We’ll be sure to announce it here in the CPS Energy Newsroom when we launch. So, subscribe to the Newsroom so you can get the news as soon as we release it. Please give me more information as how to sign up. Thank you. Hi K, as soon we have the details, we’ll announce it here in the CPS Energy Newsroom. So, subscribe to the Newsroom so you can get the news as soon as we release it. Thanks! Please sign me up. We can be reach at …. Hi… thanks for your interest in our solar options. As soon as we’re ready for customers to start signing up, we will let you know here first. So, please subscribe to the Newsroom and keep an eye out in the next couple of months. Im following up on inquiring about the solar program including Mobil/manufactured homes, that are owned, and sitting on ‘rented’ land. Will such homes qualify? Definitely interested! Looking forward to having more details. I was wondering if there were any updates on The Rooftop project? I’ve been considering installing Solar panels on my home as its situated perfectly for them. This program sounds amazing and I can’t wait to sign up. Can we call into CPS to follow up as to its current availability? I am definitely interested in solar power and I am looking forward to more details. Hopefully, I will qualify as a low income customer. Thank you. I am very interested in having solar panel placed on my roof. Please contact me to see if I am approved. I have been hearing so much about Solar panels and I am very interested in signing up and representing this great program. We had Casa Verde come to moms house and weatherize the house after my brother passed away a year ago. Mom’s house is warmer in the winter & cooler in the summer. Solar power would be the added touch in the home to assist with our high electric bills!!! Mom & I are definitely interested in qualifying or signing up for this amazing program. Hope to hear from program soon. Thank you!!! Sorry, Jimmie that’s not part of the program.